“Tax havens were always elsewhere – Alpine valleys and Caribbean islands. But are we really the good guys? 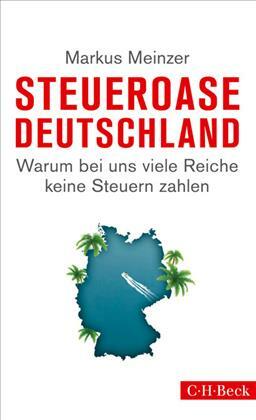 Backed by many years of extensive research, this book reveals for the first time the role that Germany plays in international capital flight and money laundering. An uncomfortable suspicion is growing that those who are rich, prominent and powerful — or better still, working in banks — are often above the law in this country. A special website for the book has been created on the German TJN Blog to host follow-up discussions on the book, which will most likely create quite some controversy. See also the twitter hashtag #SteueroaseDeutschland. The book can be ordered without involving tax-avoiding companies, and without shipping cost in Germany, Switzerland and Austria, directly from the publishing house. Watch out, too, for Germany’s role in the forthcoming 2015 Financial Secrecy Index, due out in less than two months. You say tax is necessary for democracy to work ! I say there is no democracy, we don’t have anywhere in the western world a democracy ! I am a German citizen and I really think that some are privileged and some are not. Most of all i hate that I have no right , no saying in the use of the tax ! That makes me hate to pay tax , so I am going to avoid Tax where I can. I even choose countries to work in , where I have to pay no tax or little tax. I am not an office person , I work physically hard ,in the future days I will have some disabilities the work will have its toll on my body , all in my profession have. They all retire with some painful disabilities ! But when you work in Germany and you want to own a suitable house a property its with the taxed payment not possible to reach. It will remain as a dream. You have to break out of that system. Don’t pay tax and social welfare work for your own pocket. When not you remain till your life end as a rent payer and with the outlook for the future that you might need social welfare additional to the pension you have paid all your working life , makes you depressive and you feel betrayed. I feel tax is a form of slavery , implemented by the slave drivers . Who dictates the the amount and the USE of tax is the slave driver ! Hmmm, interesting. We presume you will avoid using roads, courts, benefiting from police protection against robbers, sewage systems into your home (what do you do as an alternative?) Of course politics is horrible in Germany as in any other country, but what better system exist to provide collective goods other than a collective one?